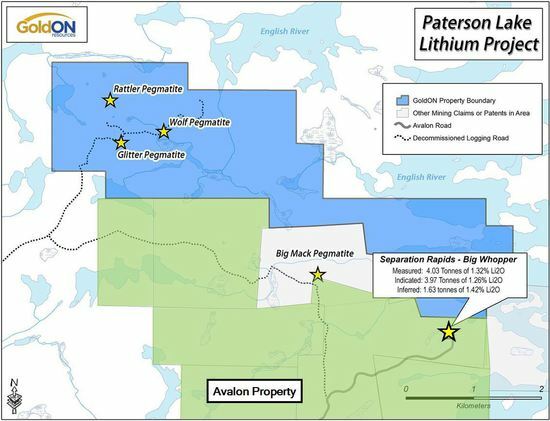 Toronto, ON – Avalon Advanced Materials Inc. (TSX: AVL and OTCQX: AVLNF) (“Avalon” or the “Company”) is pleased to announce it has closed a transaction with GoldON Resources Ltd. (“GoldON”) to acquire a 100% interest in the seven-claim, 1,008 hectare, Paterson Lake property (the “Property”) located adjacent to the north and west of Avalon’s Separation Rapids Lithium Project near Kenora, Ontario. In consideration for the acquisition of the claims, Avalon has issued 500,000 common shares of its capital stock to GoldON. The shares will be subject to a 4 month hold period expiring on July 2, 2017. As illustrated on the accompanying map, the Property is host to three known lithium pegmatite occurrences known as the Glitter, Wolf and Rattler, along with a number of other, smaller, under-explored lithium – tantalum – rubidium – tin bearing pegmatites. These occurrences fall within the same geological formation that hosts Avalon’s Separation Rapids pegmatite deposit. Some of these occurrences are in close proximity to targets planned for testing during the Company’s upcoming drilling program and may be included in this program. The technical information included in this news release has been reviewed and approved by Donald S. Bubar, P.Geo. Qualified Person under NI 43-101. This news release contains “forward-looking statements” within the meaning of the United States Private Securities Litigation Reform Act of 1995 and applicable Canadian securities legislation. Forward looking statements include, but are not limited to, information or statements about expected future drilling and exploration programs, potential discovery of additional lithium pegmatites in the Separation Rapids region, building a lithium production facility in Kenora , and potential growth in demand for lithium battery materials. Generally, these forward-looking statements can be identified by the use of forward-looking terminology such as “potential”, “scheduled”, “anticipates”, “continues”, “expects” or “does not expect”, “is expected”, “scheduled”, “targeted”, “planned”, or “believes”, or variations of such words and phrases or state that certain actions, events or results “may”, “could”, “would”, “might” or “will be” or “will not be” taken, reached or result, “will occur” or “be achieved”. Forward-looking statements are subject to known and unknown risks, uncertainties and other factors that may cause the actual results, level of activity, performance or achievements of Avalon to be materially different from those expressed or implied by such forward-looking statements. Forward-looking statements are based on assumptions management believes to be reasonable at the time such statements are made.. Although Avalon has attempted to identify important factors that could cause actual results to differ materially from those contained in forward-looking statements, there may be other factors that cause results not to be as anticipated, estimated or intended. Factors that may cause actual results to differ materially from expected results described in forward-looking statements include, but are not limited to market conditions, and the possibility of cost overruns or unanticipated costs and expenses as well as those risk factors set out in the Company’s current Annual Information Form, Management’s Discussion and Analysis and other disclosure documents available under the Company’s profile at www.SEDAR.com. There can be no assurance that such statements will prove to be accurate, as actual results and future events could differ materially from those anticipated in such statements. Such forward-looking statements have been provided for the purpose of assisting investors in understanding the Company’s plans and objectives and may not be appropriate for other purposes. Accordingly, readers should not place undue reliance on forward-looking statements. Avalon does not undertake to update any forward-looking statements that are contained herein, except in accordance with applicable securities laws.